The Minister of Planning Dr. Nouri Sabah al-Dulaimi on Thursday launched the Executive Directorate of the Poverty Reduction Strategy in Diyala province, stressing the importance of implementing projects according to the service value of each and consolidating efforts to ensure tangible services to citizens during the current year. 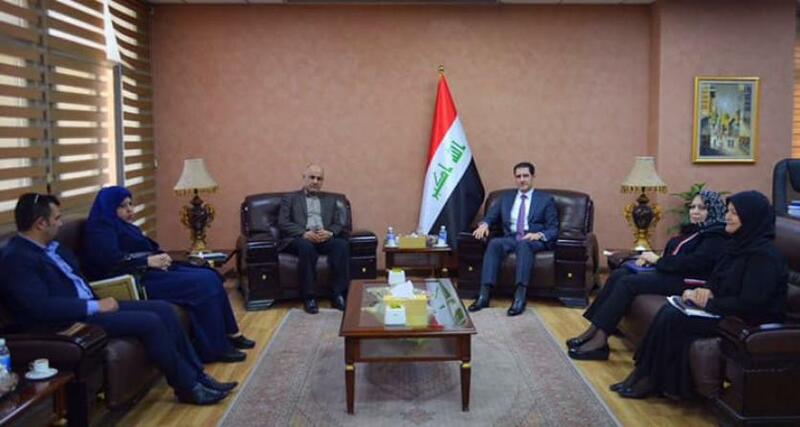 The meeting was attended by Dr. Nuri al-Dulaimi, the head of the Diyala Provincial Council, Dr. Ali Al-Daini, the Deputy Governor of the Governorate, Mrs. Nahida Al-Daini, and the accompanying delegation, in the presence of the Director General of the Executive Directorate for Poverty Alleviation Strategy . During the meeting, the minister highlighted the Ministry's priorities in empowering the fragile and middle classes, providing them with basic services, improving their living standards and ensuring the sustainability of their income, pointing out the importance of providing low cost housing units through the use of local and international efforts. For his part, the Diyala delegation praised the vision of Al-Wazra for the next phase and the plans included in the poverty alleviation strategy, stressing the strengthening of joint cooperation with the concerned ministries in the governorate.